Richard W. Jenkins dedicated his life and career to the protection of the United States. 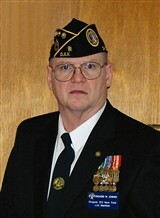 With expertise in telecommunications and computer consulting, he is regarded for his technical excellence in maintaining and operating Armed Forces Radio. He also managed all satellite communications to ensure proper transmittal for defense services. Mr. Jenkins served in Vietnam between 1967 and 1968, and in Korea between 1980 and 1982. He is also a Cold War veteran, and served in Germany, Korea and Panama. When asked about his 23-year tenure with the military, he noted that his greatest career achievement was running the Korean and Panama TV and radio services as chief of maintenance for both networks. Click here to read Richard Jenkins’ newsletter!